One of the world’s biggest ship owners, our client has 40 years’ experience in transporting goods to over 500 of the world’s commercial ports. With a fleet nearing 500 vessels, together with over 30,000 global employees transporting a volume of nearly 20 million TEUs in 2017 alone, they’re world leaders in shipping and a major player in the economy. With their range of services and transportation expertise, and a growing crew of seafarers, our client needed a reliable and experienced catering partner for a large part of their shipping fleet. With high standards, they needed full commitment and dedication from their new partner to make sure the service met their custom requirements and expectations. With V.Group’s status as the leading global provider of maritime support services, we were fully confident our own Oceanic Catering division could deliver exactly what the client needed. With Oceanic Catering chosen as their newest catering provider, it was agreed Oceanic would undertake services on a handful of vessels in the fleet for a 4-month trial period. This initial cooperation was deemed a success on all fronts and the fleet owner made the decision to transfer the majority of its vessels to Oceanic shortly afterwards. To make the project a success, Oceanic set up a dedicated procurement fleet. At the same time, both Oceanic and client agreed on a set of specific trainings for the galley crew to be provided at Oceanic’s training facilities in Manila, Goa and Odessa. Following that, continued coordination with the ship owner’s agencies in key locations around the world allowed Oceanic to offer training courses for as many cooks as possible. 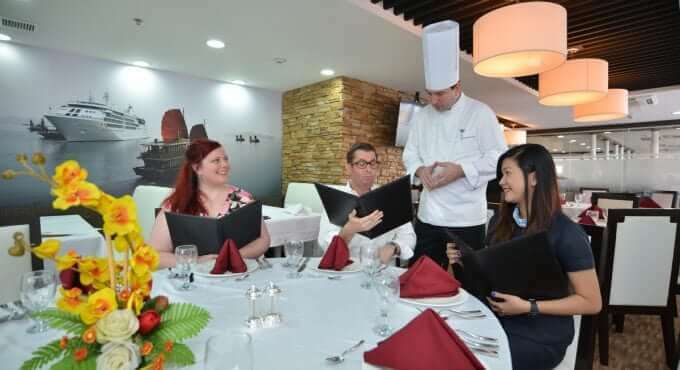 Beyond initial setup and coordination, Oceanic Catering superintendents in different locations would undertake frequent visits onboard the vessels in order to assess the service, obtain feedback from seafarers and deliver onboard training as and when required. Oceanic also briefed and trained all head chefs in the skills necessary for successful stock management and administration. Attendance from Oceanic at yearly crew conferences offered an opportunity to review the service, getting feedback from the seafarers who were benefitting. Periodic meetings at the ship owners HQ would also be arranged to review the service with key stakeholders. Oceanic Catering have more than 20 years’ experience in providing world class catering services to the marine community around the world. Together with onshore and onboard training, and V.Group’s procurement advantage, Oceanic Catering is now the main catering provider for our client’s fleet.